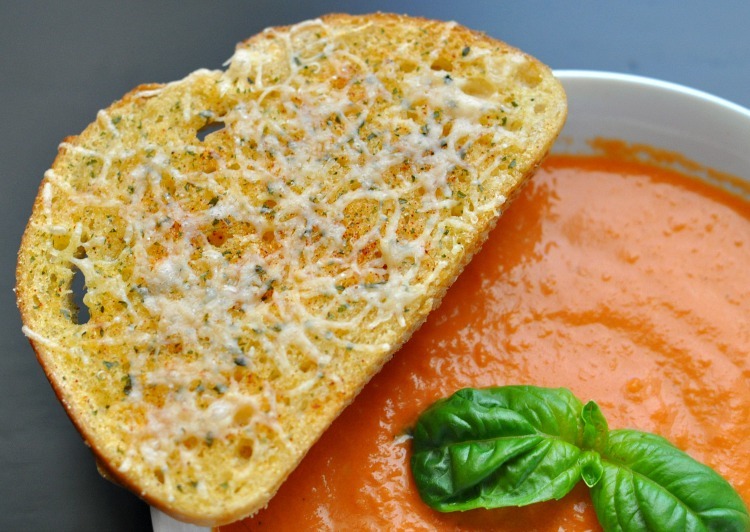 Thank you to San Luis Sourdough® Bread Co. for sponsoring this Cream of Tomato Soup with Garlic Parmesan Sourdough Toast recipe. All opinions are my own. You know how there are some flavors that just bring you back to your childhood? Cream of Tomato soup is one of those flavors for me. Over the years as I’ve started making more things from scratch, the stuff from the can just doesn’t do it for me anymore. That’s why I started making my own cream of tomato soup. You’d be surprised by how easy it really can be! One of the things that a good bowl of Cream of Tomato soup really needs to bring the flavors to life is a good slice of Garlic Parmesan Sourdough Toast. The flavors complement each other perfectly! I like to dip my sourdough toast into the Cream of Tomato soup – there’s not much better than that! The brand of sourdough bread I used for the garlic parmesan sourdough toast is San Luis Sourdough Bread Co. They’ve been baking bread since 1983 in their San Luis Obispo bakery. I love that they’re pretty local to us! San Luis Sourdough® Bread Co. is known for its unique slow-bake process – it takes over 30 hours to bake one loaf of bread! This process yields an authentic sourdough flavor, and crisp, bubbly crusts. I also love supporting brands that support the non-GMO movement. 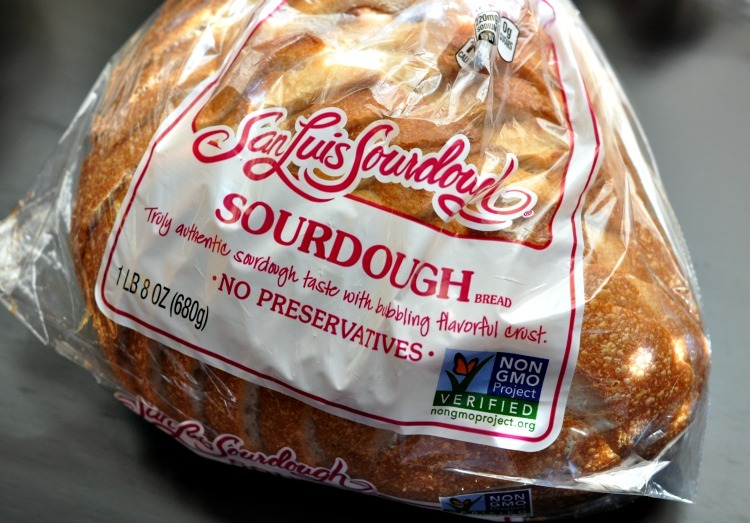 Recently, a number of San Luis Sourdough’s breads were officially Non-GMO Project Verified* so I’m even more thrilled to be supporting them. Since I can get San Luis Sourdough Bread Co. breads at our local grocery store, they’ll be my family’s choice. If you’re looking for a delicious homemade cream of tomato soup recipe to keep your family warm and nourished on a cold day, give this recipe a try and let me know what you think! Cream of Tomato soup paired with garlic parmesan garlic toast can bring back childhood memories for me. It's so easy and delicious to make it from scratch! In a large sauce pan, saute the diced onion in the butter for about 5 minutes or until it starts to turn translucent. Add the garlic, and continue to saute until the onions and garlic are soft. Add the diced tomatoes and tomato paste and stir to combine. Add the vegetable or chicken stock and heavy cream, and stir to combine. Bring to a gentle boil, then turn the heat all the way down to low and simmer for about 15 minutes. Use an immersion blender to blend the soup into a smoother texture. 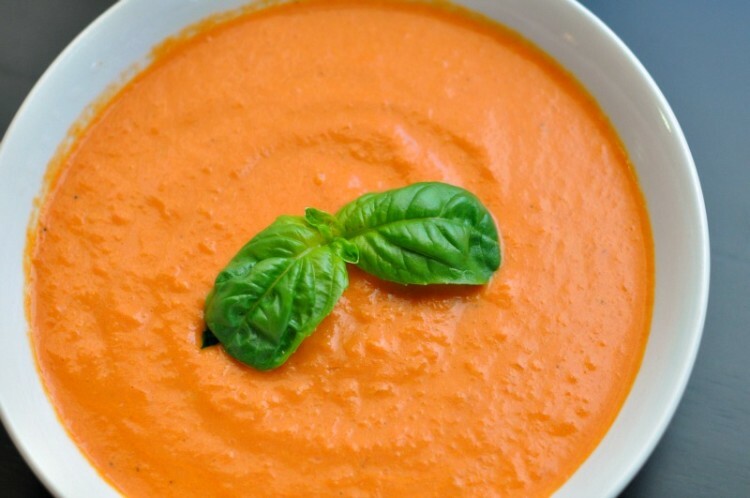 For an even smoother texture, you can blend the cream of tomato soup in a high powered blender like a Blendtec. We like ours with some texture, so we use an immersion blender. 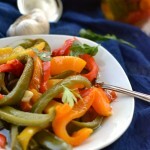 Serve in bowls garnished with fresh basil. Add salt and pepper to taste, if needed. Spread a thin layer of butter over each slice of bread. Season the bread with garlic powder, salt, parsley and paprika, then top with 1-2 teaspoons of grated Parmesan. Toast in the toaster oven for 2-3 minutes and serve with the cream of tomato soup. It tastes amazing dipped in the soup! * What does it mean to be Non-GMO Project Verified? Have you ever made Cream of Tomato Soup from scratch? This looks amazing! I can’t wait to make it. My husband loves tomato soup so I’ll have to put this on the menu soon. Thanks for sharing!